GlassRoots is a nonprofit organization in Newark NJ, founded in 2001. GlassRoots lives its mission to “transform lives, especially of under-served youth, by fostering life-long learning and creative self-expression through the wonder of glass-making”. GlassRoots works diligently to counter the challenges youth face by providing a safe environment, positive role models, and rigorous program and skill development opportunities through the creation of glass art. Its 13-year history has successfully proven that it is possible to marry art and entrepreneurship through real life application of talent, interest and skills. GlassRoots core programs, offered for teens and young adults, include STEAM (science, technology, engineering, arts and math) and are offered as in-school residencies, after-school and summer arts programs, and as workshops, using competency in handling molten glass as a pathway to personal development. GlassRoots also engages adults in “art for art’s sake” workshops held on evenings and weekends, and can be found on the CREATE section of their website. Check out their Summer Programs! At GlassRoots, they work to fan the embers of creativity in young people until they burn hot enough to forge bright futures. In the hotshop at 10 Bleeker Street, risky behaviors are replaced by production teamwork as student groups form glass vases, cups and artistic items in the 2,200 degree heat of the furnace; in its flameworking studio they use gas torches to melt glass and create fine jewelry; in the flat shop students explore the ancient art of mosaics along with more modern techniques, and in its classrooms, business and entrepreneurship come to life. GlassRoots programs engage students over a long term and have the potential for a high impact. With the growing complexity of the world and the increasing demands of the 21st-century workforce, there is little question that all students should graduate from high school fully prepared for college AND careers. All of our secondary school programs use a college and career readiness frame, especially for STEM-related majors and careers. 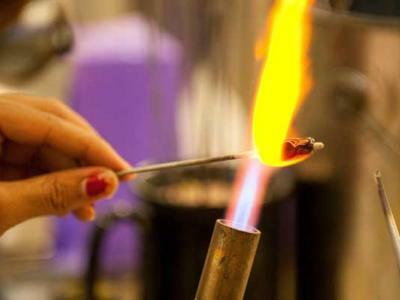 GlassRoots uses glassmaking and the elements fire and danger to engage youth while teaching them about the math, physics, chemistry and history of glass. Since glassmaking is a collaborative effort, students also learn life skills such as focus, teamwork, problem solving and responsible behavior. While educational programs focus on youth in high risk situations, they also serve special needs and home schooled students as well as disabled adults.